Aunt Vickie is currently writing a term paper about birth order. She interviewed me about how I have seen birth order affect personality and raising my children. I couldn't think of a lot of concrete examples. But this morning birth order smacked me in the face. She found one of the boys soccer trophies. 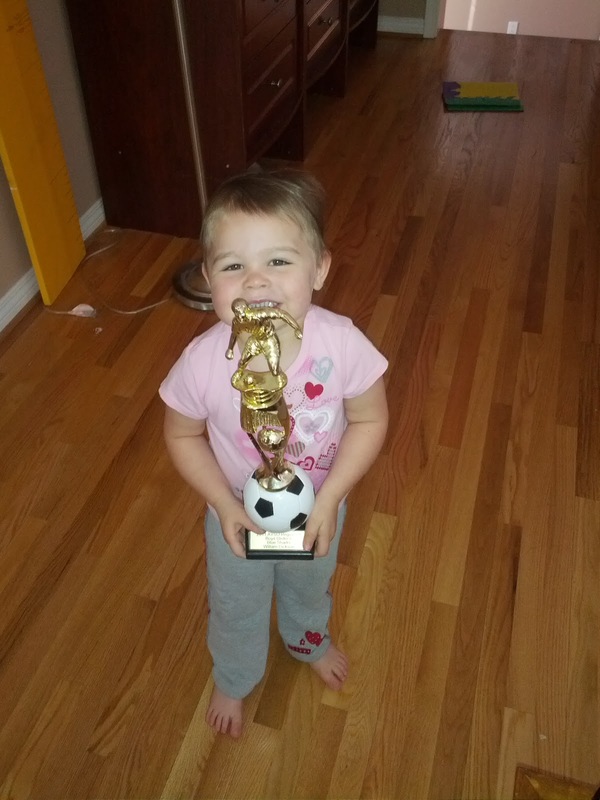 She came out of the bedroom and said, "me soccer ball trophy" "take a picture" "Cheese". Really?!?! She truly is a product of her generation and her siblings. She has watched me snap pictures of big siblings showing off their trophies, art work and certificates. She understands the pride is accomplishments and how that should be shared. Or she is just playing copy cat.